These handmade caramels are an update of a classic candy. Each rich, smooth confection is made with a combination of old-school methods and a few new-fangled techniques—and a dash of interesting flavors sprinkled in. This boxed set of three cylinders contains over 50 pieces and comes perfectly presented for gifting (or treating yourself). Dimensions: 8.5" x 8.5" x 3"
These were excellent. Very fine caramels. This product seems a bit pricey but enjoyable. Candy man Jason McCrea paired his passion for crafting handmade caramels with a background in science. 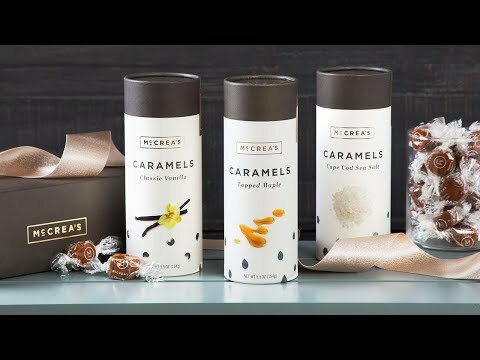 Sprinkle in some innovative flavors, and you’ve got McCrea’s Candies. 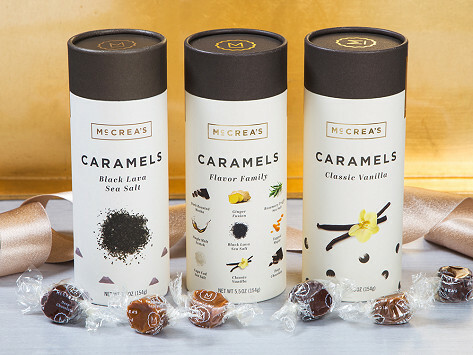 McCrea’s caramels are made in Boston with all-natural ingredients that are locally sourced when possible—and they skip corn syrup. This results in surprisingly smooth caramels, which Jason makes distinctive with unexpectedly delicious flavors like Black Lava Sea Salt and Single Malt Scotch. Jason started making caramels years ago at home with his regular pots, pans, and candy thermometer. Today he uses a pretty similar small batch, by-hand approach, with a few smart upgrades—like a batch cooker that regulates temperature and a retooled, early 20th-century wrapping machine that speeds up the caramel cutting and wrapping process. Those charming details, along with the fabulous ingredients and flavors, make McCrea’s candies extra sweet in our book.